Hurricane Patricia approached the coastline of Mexico from the Eastern Pacific. 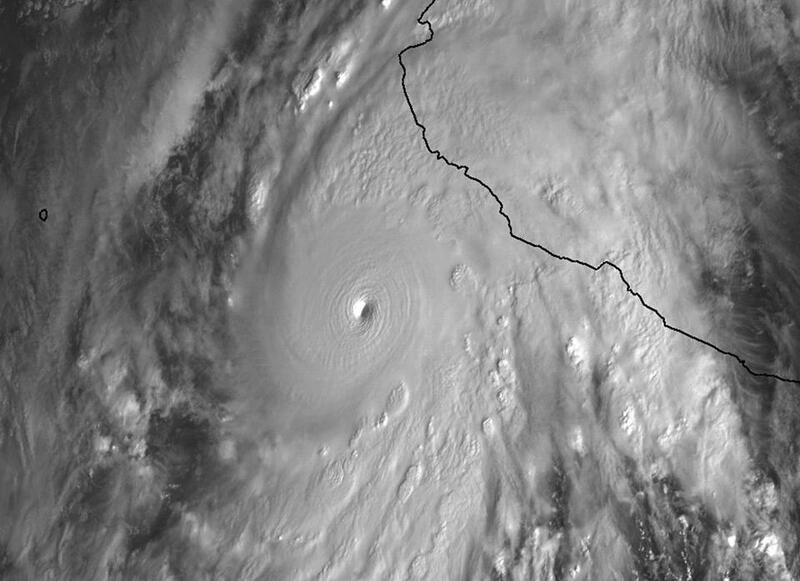 As it steamed toward the picturesque resort coast of southwestern Mexico on Friday, Patricia broke the record for the most powerful hurricane ever recorded in the Western Hemisphere. The strength of such storms is typically measured by either the central pressure of the storm or wind speed. More intense storms have lower pressures and higher wind speeds. Patricia’s minimum central pressure dropped to a record-low 880 millibars, or 25.99 inches of mercury, as of 10 a.m. Friday, according to the National Hurricane Center. Maximum sustained wind speeds reached 200 miles per hour. Storms ranked by lowest recorded central pressure. Lower pressure indicates stronger storms. Stronger tropical storms have been measured in the Eastern Hemisphere, which includes the western Pacific Ocean. Typhoon Tip in the Northwest Pacific in 1979 had a recorded central pressure of 870 millibars and maximum sustained winds of 190 miles per hour. Meanwhile, Typhoon Nancy in 1961, also in the Northwest Pacific, with pressure of 888, had recorded sustained winds hit around 215 miles per hour, though more recent research suggests that wind speeds measured during that era may be overstated. In terms of impact on people, the peak intensity of a storm is not as important as its strength when it makes landfall, weather experts said. “If it remains out at sea, the economic and human impact is obviously much less,” said Clare Nullis, a spokeswoman for the World Meteorological Organization. She said forecasters there believe that when Patricia makes landfall it will be similar in strength to Typhoon Haiyan, which hit the Philippines in November 2013, wreaking widespread devastation. “When it made landfall, Haiyan was 895” millibars, she said, though it had been stronger just previously. Also, while tropical cyclones (which include both hurricanes and typhoons) are often measured by wind speed, “most of the deaths are caused by water (storm surge and flooding) rather than wind,” Nullis said in an e-mail. “It looks like Patricia is going to have both big storm surges and torrential rainfall, according to the latest from the National Hurricane Center,” she added.